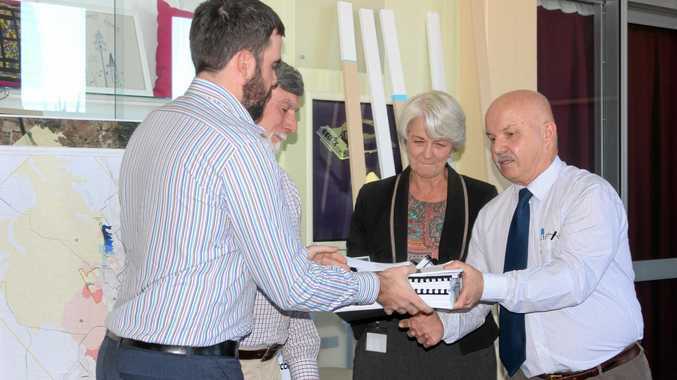 AECOM Hydrologist, Ben McMaster and Project Manager, Jim Niehoff hand over the completed feasibility study to Rockhampton Region mayor, Margaret Strelow and Council's General Manager Regional Services, Bob Holmes. NEWS of the South Rockhampton flood levee being given the green light for funding was "so exciting", it forced Rockhampton Mayor Margaret Strelow to cut her leave short. Cr Strelow was in Vietnam when she heard the news that council was successful in achieving $25 million funding from the Federal Government. At yesterday's ordinary council meeting, Cr Strelow thanked councillor Cherie Rutherford for stepping in as Acting Mayor while she was away and said she cut her leave short when she heard news of the levee bank funding. "I wouldn't miss it for the world," Cr Strelow said. "That is amazing news for us." In the meeting, councillors discussed the project before Cr Strelow explained that they would be looking at a business case as the "next step forward". She said the funding approval means council now has "to get their act together to proceed". Engineering consultants AECOM have already been given the project and design the proposed levee, and Cr Strelow explained that they would continue to use them. 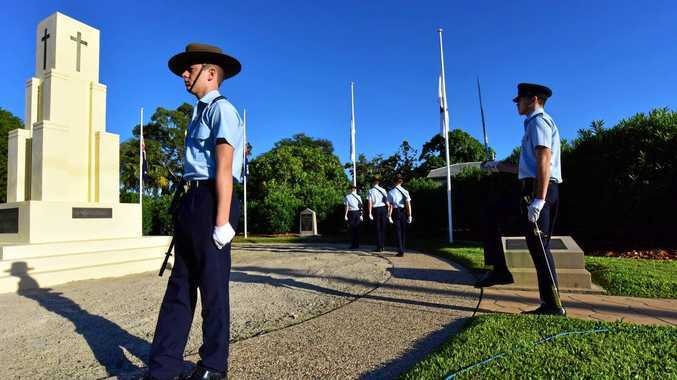 She also said AECOM's project manager for the Rockhampton levee, Jim Niehoff, called her when she was in Vietnam to say he was "thrilled to see his baby is finally going to be built". Mr Niehoff has been involved with the project since 2014. Mr Niehoff is an international geotechnical engineering consultant with more than 35 years experience with the design and construction of foundations for low to high-rise buildings, levees, earth and rockfill dams, landfills, mining and tailings ponds, deep excavations and seismic evaluation. He has been involved with jobs all over the world including a $1 billion flood mitigation project in Saudi Arabia. It was noted in the meeting agenda AECOM would now need to complete the detailed design and construction documentation. In perfect timing, councillors also mentioned how appropriate it was to have the announcement come this year in the centenary of the "most damaging flood since European settlement" (1918 floods). Cr Strelow explained that the levee would not fix all the issues surrounding floods in the city. "There will still be a number of properties affected," she said. 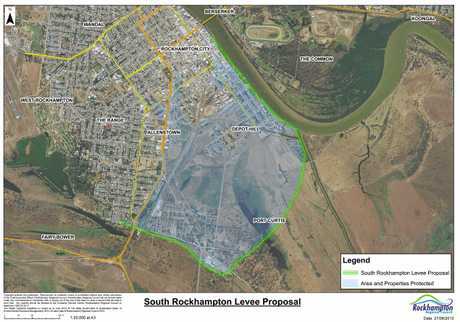 She said once the South Rockhampton levee goes through, they would "progressively work through other parts of the city". 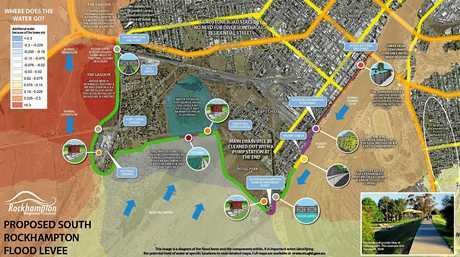 Splitters Creek flood levee was discussed for some parts of Park Avenue. "It doesn't make it dry, it makes it drier," Cr Strelow said. It was reported in a 2011 Fitzroy River Flood Study the Splitters Creek Levee runs from the southern side of Limestone Creek, near Alexandra Street to the river. It then runs south alongside the river to the mouth of Splitters Creek near the Larcombe St crossing. Councillor Ellen Smith mentioned community consultation has been going well in Port Curtis and asked if there could be some discussions with residents on the outskirts of Gracemere.